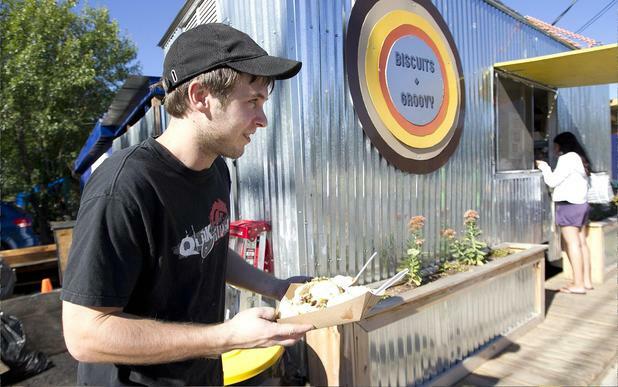 Food trailers have become ubiquitous on the Austin foodie scene, but it wasn't always that way, Statesman.comreports. Trailers now number 1,200 in Travis County and are an important part of Austin's unique culture, but just 6 short years ago, were limited to taco stands on the East Side and the "roach coaches" that traveled to construction sites to feed workers. When Torchy's Taco's owner Michael Rypka opened his first location on South First in 2006, the year that also saw the debuts of Hey Cupcake and Flip Happy Crepes, people scratched their heads at what in the world he was doing selling food out of an Airstream. But now, in addition to that first trailer, Rypka has 11 other locations, including in Dallas and Houston, plans to open two more Austin locations, and keeps 450 people in a job. The popularity of food trailers (and trucks in some cities), continues to rise nationwide, and in Austin, it has contributed a new facet to Austin's identity, adding "foodie destination" to a robust resume that already has "live music capitol" and "silicon hills" under special skills. In addition to attracting tourists, food trailers are a great small-business opportunity in a town crawling with entrepreneurs and they serve as test kitchens for a lot of chefs who go on to open brick-and-mortar restaurants. Trailers appeal to those wanting to start serving food because opening one costs a fraction of opening a restaurant in a building. Counter Culture owner Sue Davis started her business in a trailer on North Loop before trading it in earlier this year for a brick-and-mortar version on the East side. She said Austin's a great place to open a trailer because people are always eager to try the next new thing and write about it. It's maintaining a business "after the buzz (that) you have to worry about. ", she says. Looking for a great apartment near all the best trailers? Call Apartment Specialists today! Its a great idea to have a good trailers in the neighborhood area. I live in rented Houston apartments, there i found all the facilities for my family and children. I just satisfied with the place where i am living.